Our Land of Enchantment happily includes the magic of snow. The cool, green mountains of Summer are transformed into glittering wonderlands by snowfall and the blue sky that follows. Snowshoeing is one of the easiest ways to enjoy the magic. In my youth, snowshoes were big, wooden, practical affairs used for the business of getting around when other means failed. Covering distance with 4-foot-long Michigan-style beavertails was work. But two brothers in Washington state changed the snowshoeing world in 1972 when they designed the first aluminum-framed, oval snowshoes. Snowshoes from Sherpa started a revolution which continues today with the development of lighter, tougher, easier-to-use snowshoes for all conditions. Today, many recreational models are available. Ones meant for on-trail use, ones for back country travel–there are even tiny snowshoes for running races. Plenty of good, middle-of-the-road models for casual use are easy to find and use. Are you thinking of buying? All snowshoes are not created equal. My suggestion is to rent, take a class or go on a guided outing first. If you’re doing it yourself, ask for advice on what to try and practice putting the snowshoes on over your boots in the comfort of home. Once you’ve been out on the snow with snowshoes, the seemingly small differences in bindings (the fastenings to your boots), cleats and other features become more apparent. For Outspire guests, we’ve chosen to use higher-end recreational style snowshoes with extra traction and better-fitting bindings. And of course you’ll get a whole primer on techniques as we hike. Dressing for the weather is important. Since snowshoeing is exercise, there is a trade-off between becoming too warm and staying warm enough. Layering, especially with moisture-transporting fabrics, is the way to go. We also use waterproof “gaiters” which cover the top of your shoe and up your leg to keep snow from sifting into boots. A daypack is valuable for carrying the extra clothing, water and other supplies. Poles are multi-function tools and a great help when used appropriately. Invite a friend and come out to play. Two or three hours on trail is rejuvenating. The solitude of a snowy woods is a fine antidote for the noise of daily life. Make a little room in your busy schedule for snowshoeing this year! 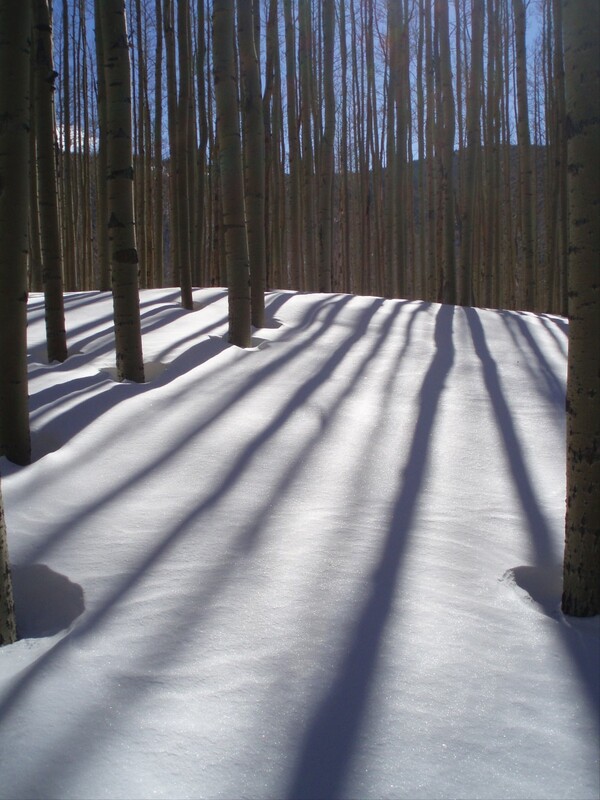 This entry was posted in Human interaction, Nature&history and tagged New Mexico, snow, snowshoeing, snowshoes, winter. Bookmark the permalink. If you are trying to find for a snowshoe trail that is near to Denver Colorado, Berthoud Pass provides numerous opportunities. Butler Gulch is a fantastic trail near Denver Colorado. Is there a website please tell me? Clear Creek County seems to have a nice overview of snowshoeing in their area west of Denver which includes the town of Idaho Falls, a couple of downhill ski areas and access to miles of US Forest Service acres. Note that Butler Gulch is considered a trail for more advanced snowshoers (at least in its full-length version).